If you’ve kept an eye on Google’s Local Snack Pack, you know it’s been featuring sponsored results. Google may be taking it to a whole new level. Ranking in the local map pack is crucial for any business’s local SEO efforts. However, we have now seen a complete and total takeover by Home Service ads in a few areas, pushing the organic listings completely out. It’s not surprising. After all, 96% of Google revenue comes from Google AdWords PPC advertising and Google seems to just keep pushing it farther. What is the Google Local Map Pack? At the moment, if you search for businesses in a location, the Google pack displays the three most relevant (and local) listings along with a map of the area. Their locations are marked on the map and the listings display the business opening hours. Nothing has been officially announced, but there have been rumblings about changes to the pack since 2015. Back in July 2015, a beta test for home service ads (HSA) was launched in the San Francisco area. The original plan was to make it easier for users to find home-service providers using Google. 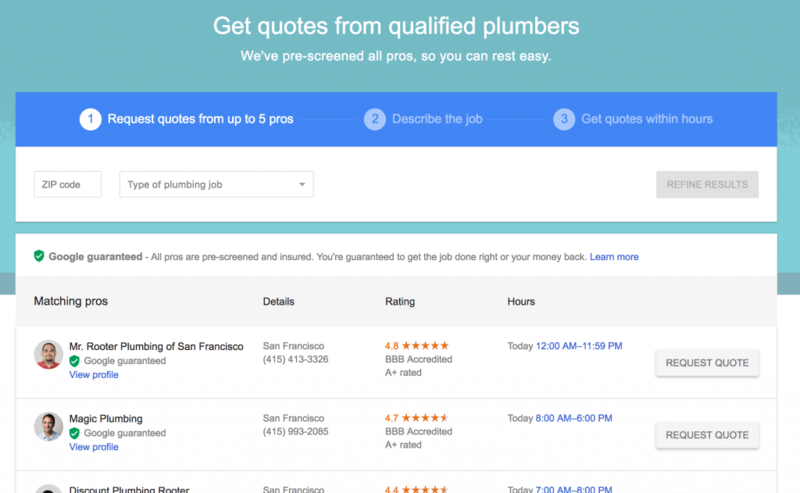 If you search for plumbers or electricians now, the first search results are AdWord ads. But under the HSA beta, the first ads display listings for 3 ‘qualified’ professionals and directly connect the users with the providers. Users can actually submit a request to those service professionals direct from the search ad. They can even compare estimates within Google itself, much like Google Compare. Unlike the old AdWords ads, these new ads include photos of the professional. They also feature the professional’s phone number, accreditation, and location. Other bonus services offered, like free estimates or 24/7 callouts, appear within the ads. The big factor is the heading that labels the professionals as ‘qualified.’ Google even points out that professionals have to pass background checks and hold the right licenses/insurance to be included. What’s really interesting is the Google guarantee. If a user isn’t happy with the quality of the work carried out by the professional then Google might issue a refund for the cost of the job. These home service ads are currently available in San Diego, Sacramento, Stockton, and the San Francisco Bay area. Will that change affect the Google local pack as a whole? 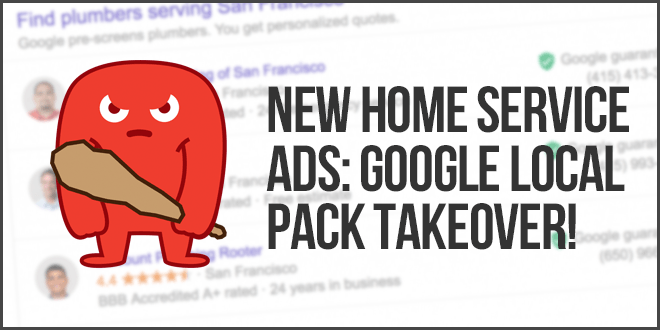 In 2015, the Google pack actually featured 7 listings. But in August, the pack changed to the 3 listings we’re used to. That change also saw the listings drop any Google+ links and physical addresses for businesses. Street names and ratings remained visible. Most people assume that users didn’t click on the listings below the third result because they appeared below the fold on mobile devices. But there are rumblings that even more changes are on the way. 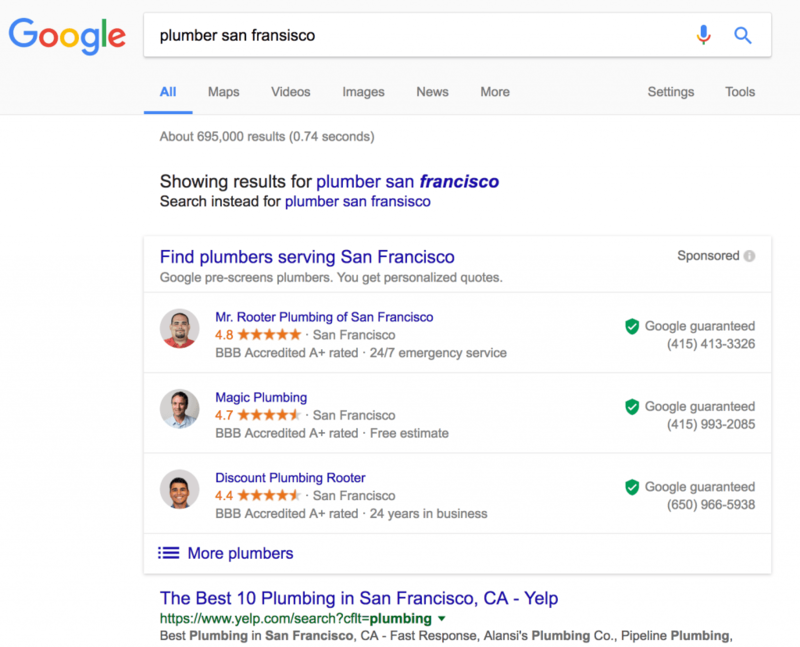 The local 3-pack will now feature a paid Google Adwords ad alongside the organic listings. So that’s one paid ad and just 2 organic results. There are already 2 AdWords Ads before the qualified professionals’ listings. So if you’re doing the SEO for a home service professional, you’ll have to contend with 6 ads above the fold. But there have also been rumors in October 2016 that Google may roll out a 4-pack of local ads. That ad pack will appear above the usual 3-pack of local listings. In some instances, the new local ad packs have replaced the usual AdWords results altogether. Organic search results will finally be shown below both of the packs. The opportunity to advertise in the local Google pack will become an extension within AdWords. Businesses who link their AdWords account and Google My Business listing will be able to use it. Are HSA Ads Taking Over? Home Service Ads program will roll out to more areas. But as it does, businesses may lose their place in the local map pack and may have to sign up to the HSA Adwords program. Apparently, the HSA listings will be rotated based on ratings or reviews on Google. After all, there will most likely be more than 3 professionals in each area! The links between HSA and AdWords are pretty fuzzy at the moment. But it looks like advertisers won’t pay per click. They’ll pay for phone calls over 30 seconds that come from each listing. This is definitely something to keep an eye on as the program arrives in more areas. You can’t change Google’s policies, But you can make changes to your websites or online presences to still make it into the 2 organic listings in the 3-pack before HSA rolls out. 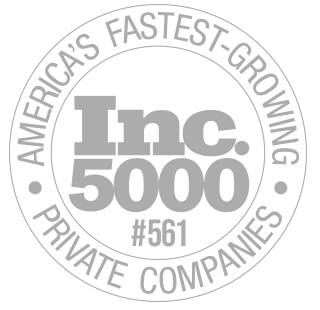 Start with your Google My Business listing. Complete all of the fields and hire a photographer to add images of your business to your Maps listing. Ask customers to leave reviews on your Google+ page. Those reviews will help you in the long run, especially if you do decide to buy into the HSA program. If you need help cleaning up your citations, the HOTH Local Citation Cleanup Service can fix those and move you up the rankings. You also need to optimize your listings on TripAdvisor or Yelp. Keep everything consistent with your brand. Encourage customers to leave reviews. That will help users who don’t use Google to search for businesses. If you want to get creative, check out these 6 tricks to increase your local SEO traffic.